And another day in purgatory…except, this is more like hell’s second cousin!! Our big activity for today was to load our bikes on a barge that will leave separately from the ferry that we take on Wednesday..I must say that the idea of not having Katie nearby is causing some anxiety as I am uncertain of the kind of treatment that the bikes will get from the barge operators. 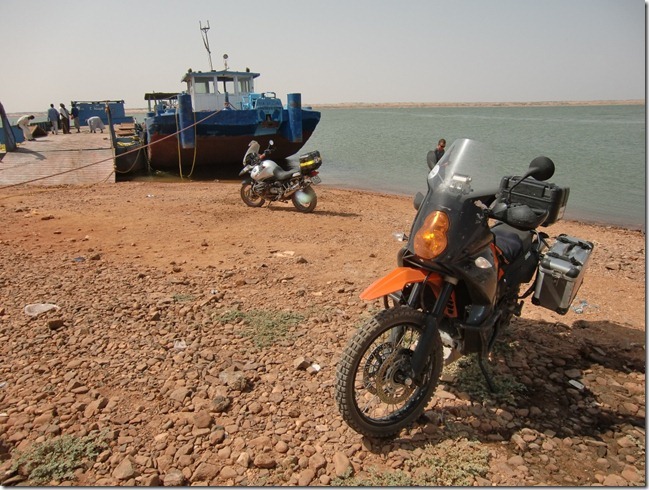 Unfortunately it is not possible to put the bikes on the passenger ferry and it is not possible for us to go on the barge with the bikes..tried that too!! 1 more day of sitting around sweating, eating, sleeping and waiting! Bikes being loaded onto the Barge. Marcus with his KLR650 that has done 70,000km thus far. 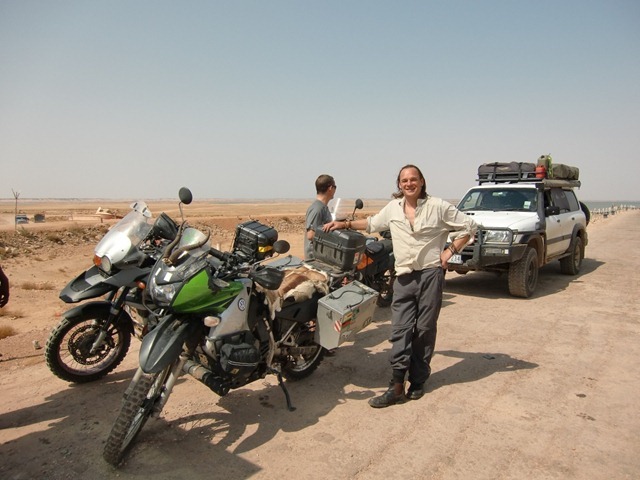 Hi Rui & Dale, Looking forward to the last leg of your majestic journey thru the tales and pics of your blog. Well done on a magnificent achievement. So close to touching those pyramids guys. Awesome. Your tale of meeting up with Marcus and his journey vs yours reminds me of back packing through Europe. After 6 months I thought I was a seasoned traveller. Then I bumped into an Aussie at a student hostel in Florence who told me he was just getting going. He had been travelling for 5 years!!! Made me feel like a real novice. By the time you get this I trust you will have hit Egyptian soil and be reunited with your misses Katie Rui. And have had a few frosties. Keep up the amazing journey boys and see you real soon. Best.Iain,Kim,Matt and Spuggy. Rui/Dale. You must stop at Soma Bay just south of Hurghada. In 1991 I started negotiating to secure a golf course contract for Gary Player Design Co. with developers Wagi Hanah and Farid.They had a dream to build a golf course and hotels on the border of the Red Sea and to call the project Soma Bay. Gary and I visited the siter and he thought I had lost my mind. It was a stretch of totally desolate desert that had only ever been occupied by the military for munitions testing. I took a $500 bet with Gary that the course would get built.Guess what, There are now several luxury hotels and the golf course. Apparently really nice. Been following your journey via this site. Great stuff! We’ll be doing a simliar route next year with our bicycles from Cape to Cairo. Been helluva informative looking at your pics and blogs! Looking forward to your reunion with Katie….we have a bet going at home, whether or not she’ll be back.